Over 20 years ago I received a gift. A gift which I think it’s fair to say, changed the course of my life. It was an essential oils starter kit, together with the book “Practical Aromatherapy” by Shirley Price. 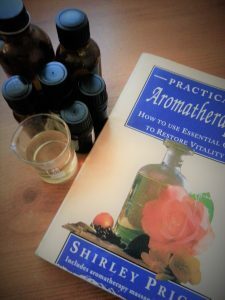 I had no idea back then, that 20 years later I would actually be an Aromatherapist, producing my own range of Aromatherapy products. In fact, a lot has changed since then, both with me and with the world around me. Yet despite that, sometimes when I smell Ylang Ylang, I am reminded of that exact time 20 years ago, when I opened my first ever bottle of Ylang Ylang essential oil. No doubt you’ve experienced something similar, when a familiar smell, evoked past memories and instantly took your mind back to that time and place. Scent memory is perhaps one of the strongest of feelings we experience. And no matter how many years have passed, often the feeling associated with the smell can be just as strong. This incredible process is controlled by the Limbic system. The part of the brain responsible for emotions and memories and it’s one of reasons why essential oils can be so beneficial. When we smell an essential oil, the scent is picked up by the neurons in the olfactory centre and transported to the brain. The brain then stimulates the release of hormones and neurotransmitters in the bloodstream. This can lead to a number of effects, such as happiness, stimulation, relaxation, calmness or other mood changes. In fact, such is the power of these aromatic oils that, they are being used for their healing properties all around the world. I still have that book and refer to it often, although admittedly it is well thumbed now. 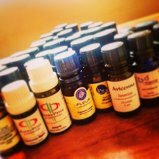 And over the years my essential oil collection has grown from those 8 mini bottles that I started out with, to a collection of over 50 different scents, all amazing and all different. Essential oils are not actually oils at all, at least not in the way we think of oils. They don’t have the same greasy feel as oil, but they have been classified as oils because they are not water soluble. They are extracted from aromatic plants, including flowers, herbs, trees and fruit, using either cold pressing or steam distillation techniques. Some plants contain lots of essential oil (e.g. citrus fruits), whilst in others the yield is fairly small in comparison and so the price of essential oils can vary greatly. The oils are categorised into either TOP, MIDDLE or BASE notes and a well – rounded aromatherapy blend would consist of oils from each note. TOP NOTES are generally light and stimulating. They are usually the first note you will detect in a blend. Citrus oils can be found in this category. MIDDLE NOTES are considered balancing and are usually floral or leafy. BASE NOTES are usually woody, earthy or resinous and have a deeper, longer lasting aroma. 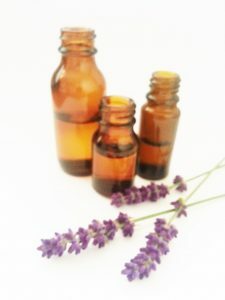 Essential oils are susceptible to heat, light and oxygen so need to be stored in a cool, dark place, preferable in dark glass and always tightly sealed. If left out in the open air they will over time evaporate. They should never be stored in plastic containers as they are so strong that they will penetrate the plastic container. This will eventually leading to degradation of the plastic and possible contamination. We use glass containers where possible for our aromatherapy products to ensure that this isn’t a problem. INHALATION – whether in a diffuser / oil burner, scented candle, room spray / spritzer, sachet or directly with an aromatherapy inhaler. This is a great way to surround yourself with your favourite aromas. MASSAGE / SKIN APPLICATION – diluted essential oils can be used to enhance a massage treatment. Or they can be added to a salve, balm, cream or oil, specifically to apply to problem areas. BATHS – this method works in a similar way to the skin application, as the oil is absorbed through the skin, whilst also be inhaled. Essential oils should always be diluted before applying to the skin. In fact, even when used in the bath the oils need to be blended with a carrier oil first. Oil and water do not mix, so the oil will sit on top of the water rather than dispersing. So to avoid neat essential oil coming into contact with the skin, you will need to dilute it first. When diluting essential oil in a carrier oil, a good ratio to use is 12 drops of essential oil to 25ml carrier, although this would need to be reduced for children, the elderly or vulnerable individuals. Essential oils are made up of phytochemicals, some of which you may have heard of such as menthol, which is present in peppermint. Chemicals are not exclusive to synthetic items, they are all around us in nature (think back to your school science classes and the periodic table). All living things are made up of chemicals and so are plants and some of these chemicals are very potent, in fact too potent. For this reason, it is also important to consider the safety of a particular oil before using it and also the dosage. Some plants are simply too toxic to be used in aromatherapy at all (e.g. camphor, pennyroyal, wintergreen). And others which may generally be safe to use for most, may cause problems with certain medical conditions or medication (e.g. rosemary). This is why it is important to either ask the advice of a trained Aromatherapist or do your research before embarking on the use of essential oils. Another important thing to remember is that essential oils are highly concentrated. One drop packs a mighty punch, so they should be used sparingly. In fact in many cases, with regard to essential oils, less really is more, not just in terms of safety but in scent terms too. And never ingest the oil. Some sources claim that essential oils can be added to food & drinks to enhance the body. But due to the risk of damage to the mucous membranes of the gut, it is safer to refrain from such practice. And as you would with any medication, keep out of reach of children and pets. When formulating my products, I take great care to ensure that they are completely safe. Using correct dosages, safe and non-phototoxic oils, so that they can be enjoyed by all with no risks. However, if you have a condition you should always check the ingredients, to ensure that the product is the right one for you. And in the case of home fragrancing products, also take into consideration the people around you. Is the essential oil right for them too. Essential oils are a valuable addition to any household for health and wellbeing, provided they are used responsibly and safely.